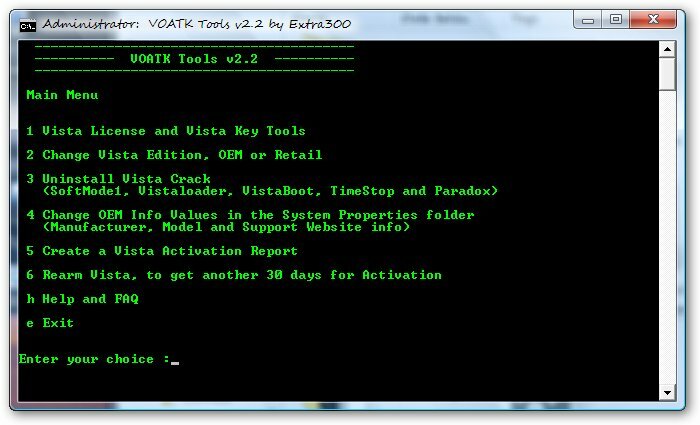 VOATK Tools v2.2 is a collection of handy Windows Vista activation and license tools to helps users to activate Vista operating system or solve problems related to activation of the Windows Vista OS. You have all the rights to believe that this freeware utility supposedly provided by Microsoft itself, but it’s not. Instead, it’s not but wrote from underground hacker named Extra300. Thus, it incorporates some “legitimate” features to deal with “not so legitimate” tools such as ability to remove and uninstall various Windows Vista activation cracks applied by activators such as Softmode1, VistaLoader, VistaBoot, TimeStop, TimerLock and Paradox, although by itself VOATK Tools is not a crack. TimeStop32 and TimeStop64, applied also by TimerLock. Rearm Windows Vista – used to get another 30 days time for activating Vista, useful for disaster recovery especially when you are unable to boot up / start Windows Vista or stuck in Reduced Functionality Mode (Guide: how to recover from Reduced Functionality Mode). Download VOATK Tools 2.2 (no longer available). Turn off UAC (you will be prompted if needed). Turn off firewall, antivirus, antispyware or any other application who could interfere with the installation (optional). Run VOATKToolsV2.2 as administrator (right click on the voatktoolsv.2.2_stand_alone.exe and click “Run as Administrator”). Can You Downgrade from Windows Vista to Windows XP?